Garret “GMAN” Louie has been marketing and promoting parties since 1990. After a trip to Los Angeles, he saw the flavor that was going down at an early age and knew he had to bring it back to Canada. On that trip, he was at trade show and acquired a streetwear clothing brand and thereafter started Canada’s #1 clothing, footwear and fashion distribution Timebomb Trading Inc.
GMAN also co-owns one of Canada’s hottest sales agencies that represents such brands as Alpha Industries, Stance, Minimum, etnies, Native Shoes and more. In 2004, he opened a retail sneaker boutique called Livestock with partners Garry Bone and Rob Rizk, which currently has four locations in Canada. In 2010, he and Rob and started their own club venture with the birth of Fortune Sound Club. 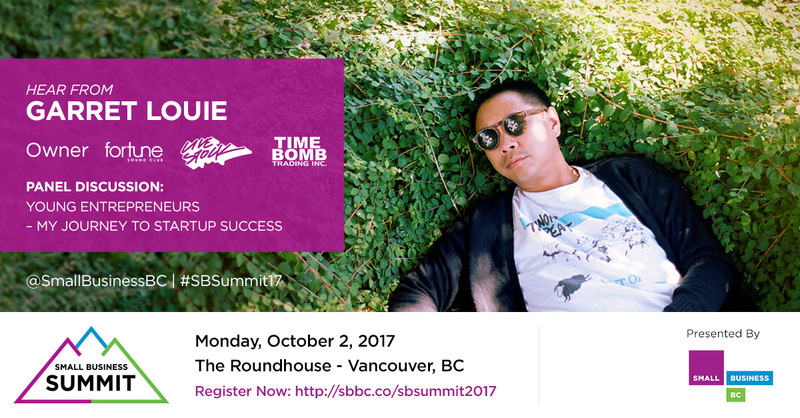 Garrett will be part of the Young Entrepreneur Panel at the Small Business Summit in October 2017. Buy your tickets today.